Last weekend, at the St. Clair County Master Gardeners Conference, I was one of four speakers. All were experts in their fields and I took lots of notes while listening to them. 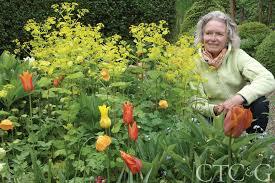 One of the other speakers, Jacqueline van der Kloet from the Netherlands, is the leading bulb designer in the world. She is renowned for her artistry in combining bulbs in a very naturalistic way and in waves of succession. I’ve always planned my bulb plantings for succession but never in such fine detail. 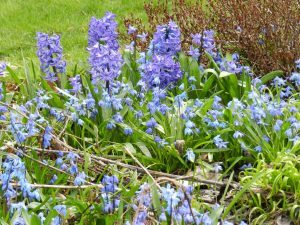 For instance, I start with the earliest bloomers, Galanthus (Snowdrops) and Eranthis (Winter Aconite), then various crocus followed by Scilla siberica (Squill), Muscari (Grape Hyacinths) and hyacinths. 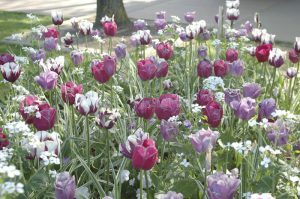 Color continues with species tulips and early Narcissus, then Triumph tulips, middle season Narcissus, Anemone blanda, Chionodoxa (Glory-of-the-Snow), and Fritillaria meleagris (Guinea-Hen Flower), followed by later tulips and alliums. Jacqueline, however, knows exactly which bulbs bloom together and when. After she decides on the bulbs for her designs, she mixes them all together in a wheelbarrow and then strews them on the ground. This creates the naturalistic patterns she wants, the antithesis of the blocky groups we are used to seeing. 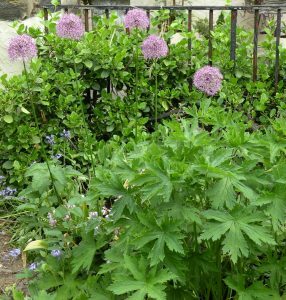 The largest bulbs (usually the latest blooming) are planted at least six inches deep. 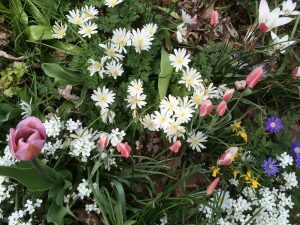 The middle layer of medium bulbs is planted four inches and, finally, the top layer (usually the earliest) of tiny bulbs is planted two inches deep. She also suggested that we could layer bulbs in containers just as we do in the garden. Why did this never occur to me? 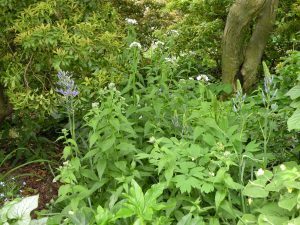 I love both Allium ‘Purple Sensation’ and Camassia leichtlinii ‘Caerulea’. Jacqueline showed a photo of them planted together – oh, so beautiful. So now I will add both to my buy list for this fall. I grow each of them but not together. Jacqueline offered many comments on other bulbs, many of which I noted for my fall order. 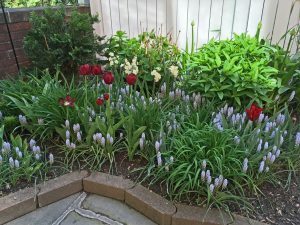 One tidbit of advice from Jacqueline is adding dry cow manure around tulips as soon as the leaves poke up. 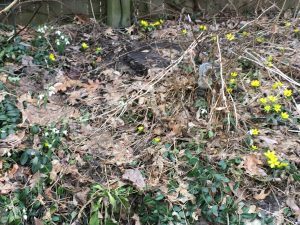 This will help give them enough energy to form flowers for the following year, assuming that they have not rotted in our clay soil. I am experimenting with putting Turface in the bottom of the planting holes. I did this last fall to increase drainage and am hoping that this will prevent rot. It would be so nice to get more than one season of bloom from tulips. What a joy it was to hear her lecture. Bobbie, I, too am learning more about layering bulbs and have started a list now while I can see spaces on the ground that are not yet covered by emerging perennials. Thanks for your post!